What do seeds need to grow? What can the wind do? What is dirt? Like learning to count or read, understanding the fascinating world of science is an essential skill. This innovative book encourages three-to-six-year olds to predict outcomes, ask questions, and investigate answers. Watch preschoolers develop essential observational and analytical skills as they eagerly jump into the hands-on, interactive process that is science. 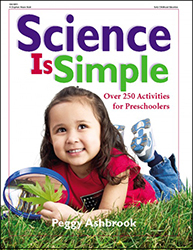 Science Is Simple contains 250 activities spanning 39 kid-pleasing science concepts. From magnets to bubbles, insects to volcanoes, there are experiments to interest each and every child. Budding scientists will “have a ball” learning about objects in motion or feeling the texture of their own homemade paper. Future astronauts will immerse themselves in making a rocket ship and watching it blast off! Children will be captivated as they learn about science and the role it plays in their everyday lives.